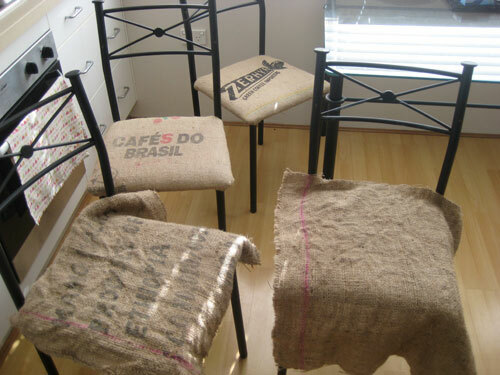 You may recall from my visit to Reverse Garbage that I picked up two coffee hessian sacks for $6 to recover my shabby kitchen chairs. I finally got around to borrowing a staple gun from a friend, bought some staples and got to work. Tip - don't buy a tool you'll probably use for just for one project, borrow and reuse instead. I'm lucky enough to have a great friend who owns every tool imaginable - if you don't have one of those friends, try the site Friends with Things. After thoroughly washing the smelly sacks with soapnuts and hanging them in the fresh air and sun for a few days the sacks came out fresh and clean and chair-ready. It took about an hour to cut the sacks into the shape and size I needed and recover two chairs (including convincing the hubby to do the stapling because anything with the word 'gun' in it frightens me). So happy with my 'new' chairs! By chair #3 I decided I was brave enough to wield the staple gun and promptly broke it, so the project is on hold. I've yet to tell my friend I've broken his gun (hopefully he doesn't read this before I talk to him! ), and it looks like I'll be buying a new staple gun after all. Looking forward to completing my project this weekend! Even with the added cost of a new staple gun, this project was very cost-effective and certainly cheaper than buying four new chairs. 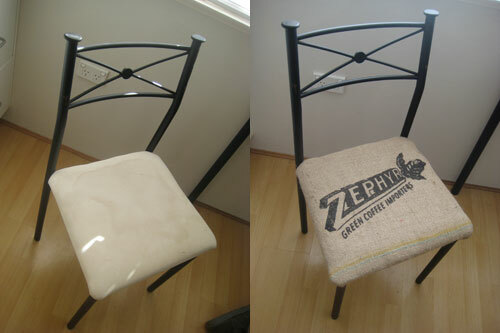 What's the cheapest furniture refurbishment you've ever completed? I've bought a new staple gun and the chairs are complete!